Private rocket launch service SpaceX has asked the U.S. government for permission to launch 4,425 satellites in orbit to beam high-speed Internet down to the world, according to a newly filed application with the Federal Communications Commission (FCC). 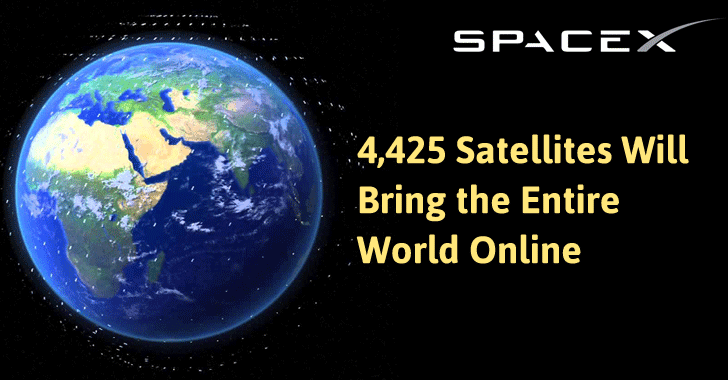 That's a hell of a lot of satellites; in fact, the figure surpasses the total number of satellites in the Earth's orbit. "The system is designed to provide a wide range of broadband and communications services for residential, commercial, institutional, governmental and professional users worldwide." Initially announced in January 2015 as part of his plan to fund a city on Mars, the project would cost at least $10 Billion, Musk estimated in 2015, though the latest documents did not mention any cost estimate or financing plan. California-based SpaceX has also revealed in the documents technical details of the proposed network of satellites it wants to launch as an Internet Service Provider (ISP) to offer high-speed broadband and communication services globally. The proposed SpaceX network would begin with an initial launch of 800 satellites, the filing states, to expand Internet access in the United States, including Puerto Rico and the US Virgin Islands, though it is unclear when these satellites will launch. The satellites would be launched into orbits at altitudes ranging from 715 miles (1,150 km) to 790 miles (1,275 km) above Earth. Each satellite in those constellations would weigh 850 pounds (386 kg) and could cover an ellipse about 2,120km wide. If deployed successfully, it would increase the number of satellites in orbit by over 300%, which altogether will serve to provide a space-based worldwide Internet network that would offer Internet speeds of up to 1 Gbps for the end users. SpaceX said, "Once fully deployed, the SpaceX System will pass over virtually all parts of the Earth’s surface and therefore, in principle, have the ability to provide ubiquitous global service." As of now, the company has not elaborated on potential uses of this massive internet network, but there's a lot of time to figure out those details. The primary business of SpaceX is launching satellites into orbit for government and commercial customers, including flying cargo supply ships to the International Space Station for NASA. However, SpaceX is not the only company looking with an ambition to deliver the internet through space. OneWeb — a venture backed by Airbus, Virgin, Bharti, and Qualcomm — and Boeing have also filed applications for spectrum to support satellite-based Internet.